adequate income in work or unemployment. In the mind of free-market extremists, securing the provision of human needs, health and well-being with adequate incomes and truly affordable homes is not the job of government. Hunger, debt, homelessness, ill health and an early death is the price low-income citizens and their children are made to pay for tax cuts. 1. The weekly Jobseekers Allowance (JSA), the cornerstone of the benefit system, is £73.10. It is nearly worthless. It equals the Universal Credit (UC) of £317 a month. 2. Since 2010, national and local government have ignored robust, undeniable evidence that low income, debt and hunger damage health and well-being. 3. George Osborne's "Living Wage" is a case in point. 4. Councils also cause real hardship with council tax, while sparing their more prosperous residents from making any contribution to the shortfall in government funding. 5. False promises about jobcenters taking the facts into account in individual cases were made during the passage of the Welfare Reform Act 2012. 6. An amendment to the Welfare Reform Act 2016 requiring the government to undertake a cumulative health-impact assessment of all its "welfare reforms" was defeated by a Conservative majority in the House of Lords. 7. 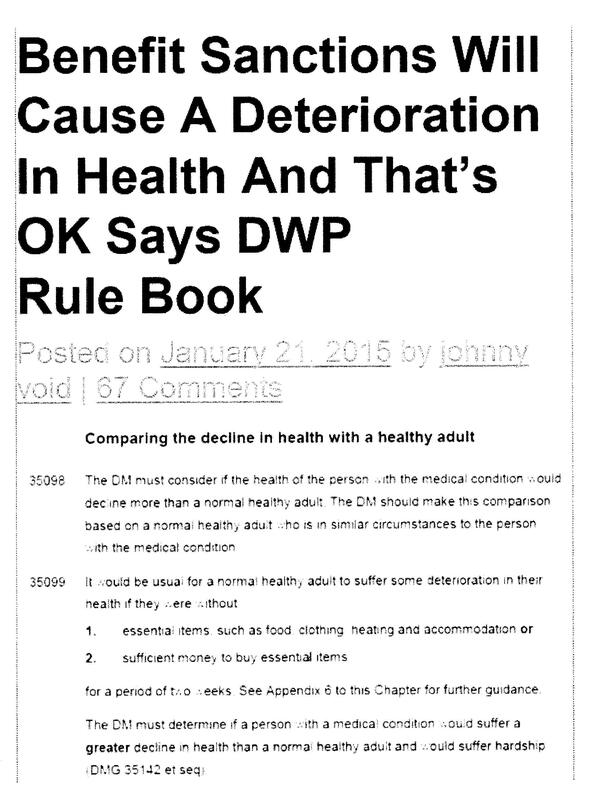 DWP writes guidance for job-centre decision-makers saying hunger is OK.
8. ​In 2015, there was an unprecedented rise in the deaths of infants of poor mothers. 9. The Cabinet Office formed and co-owns the Charity called Nesta in 2012 with which it co-owns The Behavioural Insights Team, otherwise known as the Nudge Unit. 10. Crime, unemployment and ill health are used as reasons for demolishing council housing. 1. The weekly Jobseekers Allowance (JSA) paid to unemployed single adults is £73.10, the corner stone of the benefit system, is nearly worthless. It equals the Universal Credit (UC) of £317 a month. It has been reducing in value since 1979. Increases have been frozen since April 2011. It is the cornerstone of the benefit system and the benefit to which all others are added. It is paid to 3.9 million UK citizens. In the means statement below, I have extracted from the Joseph Rowntree Minimum Income Standards 2017 (Table 2) the essential items after housing costs that a single adult needs to buy to maintain good health and be ready to restart work. The items asterisked I have priced from my own experience, since the early 1990s, of helping unemployed people prepare such a statement for the court, creditors, job centre or local authority. Many unemployed households are in debt to one or several organisations. That is not shown in the list below. But debt repayment substantially worsens a budget that is already not viable, sustainable or capable of providing a healthy life. Such a low income cannot provide a healthy diet for women before and during pregnancy, which is emphasised in points 2 and 8, to follow. The blogs on our website are written by health professionals. They provide the stark proof that both bodies choose to spurn. Facts about human needs have been culpably pushed to one side by extreme free-market politicians because they cost money. But human needs ought to be used as a valid justification for the government to raise taxes to ensure the provision of adequate minimum incomes and truly affordable housing for everyone. The humanitarian reasons are reinforced by the economic importance of having a healthy populaition on a small island competing in a large world. One of the first Acts forced through Parliament by the 2010 coalition abolished the Health in Pregnancy Grant 2010 with the Savings Accounts and Health in Pregnancy Grant Act 2010. The grant was introduced by Gordon Brown in 2009 and abolished by Chris Grayling when Minister for Employment at the DWP. It was a grant available for pregnant women who were receiving advice on how to stay healthy during pregnancy from either a doctor or midwife, normally at an ante-natal clinic. The grant was for £190, and was a one-off. That this House deplores the expected increase in the already very high poverty-related costs in ill health and educational under-achievement to the taxpayer in the schools and health service as a result of the welfare cuts; regrets that housing-benefit cuts, the abolition of the Health in Pregnancy grant and the Sure Start grant cut for second children will increase already wide income and health inequalities; notes the greater risk of underweight babies due to the malnutrition of mothers due to poverty incomes and debts imposed by cuts; further notes those babies will carry a greater risk of poor cognitive abilities, mental illness and cerebral palsy identified by the Institute of Brain Chemistry and Human Nutrition; further notes that a related increase in debts will increase the mental-health problems for adults identified by the Government Office for Science; further notes that increased number of evictions and consequent insecurity of tenure will disrupt the education of children as shown in research in Brisbane and Sydney, Australia; further notes that rented private accommodation will be difficult to find because private landlords will not risk rents paid by inadequate housing benefit, predicted by the Chartered Institute of Housing, who also predict an increase in overcrowded housing; and calls on the Government to implement evidence-based welfare policies that will improve public health. In 2016, he stole the name, but not the substance, of the Living Wage lanched in 2004 by London Citzens, UNISON and Ken Livingstone then Mayor of London. Research was initially commissioned in 1998 by the Zacchaeus 2000 Trust (Z2K) from the Family Budget Unit. They worked with nutritionists to determine the minimum income needed for healthy living. That research was taken to London Citizens and UNISON. Osborne's "Living Wage" added 50p an hour to the National Minimum Wage, but it is not anchored to any research about human needs. What is now called "The Real Living Wage" was progressed by Loughborough and York Universities between 2006 and 2008 and then funded by the Joseph Rowntree Foundation. It is now promoted by the National Living Wage Foundation. Its Achilles heel is rent, which uses up more and more of the income needed for food, in the chaotic international free market which is UK housing. Rents are also detached from human needs by financial and political arithmetic. All the parliamentary parties believe they lose votes if the value of housing goes down, so landowners and landlords are in power. Osborne's Living Wage, disconnected from the cost of living, increases from £7.50 to £7.83 for workers aged 25 and over, and from £7.05 to £7.38 for 21- to 24-year-olds. "Those whom Haringey was primarily consulting were the most economically disadvantaged of its residents. Their income was already at a basic level, and the effect of Haringey’s proposed scheme would be to reduce it even below that level and thus, in all likelihood, to cause real hardship, while sparing its more prosperous residents from making any contribution to the shortfall in government funding." There are 3.9m UK adults (i) paid a totally inadequate £73.10 a week (ii) job-seekers allowance while they are unemployed; it equals £317 a month Universal Credit. It is taxed with the council tax by 289 councils out of 326 (iii) in England and Wales. The councils prosecute residents for arrears in the Magistrates Courts. Last year the magistrates granted the councils 3.5m liability orders (iv) which give the councils the authority to enforce the tax with the bailiffs. The councils add between £115 - £130 court costs to the arrears. The bailiffs are managed by private companies, who are allowed by the Ministry of Justice to add a further £75 admin fee (v)to the council tax arrears, £235 more if the bailiffs visit and another £110 for a visit to seize goods to auction. Councils give the mobile phone numbers of late and non payers to the bailiffs who send unlimited numbers of intimidating texts. It never happened! Low-income sick people have repeatedly been sanctioned by job-centre decision-makers without taking low income and ill health into account. Here is the amendment in so far as it affected low birth weight. The Crossbench Peer Lord Ramsbotham and Baronesses Meacher and Hollins, and Labour Peer Baroness Lister tabled or supported the amendments. 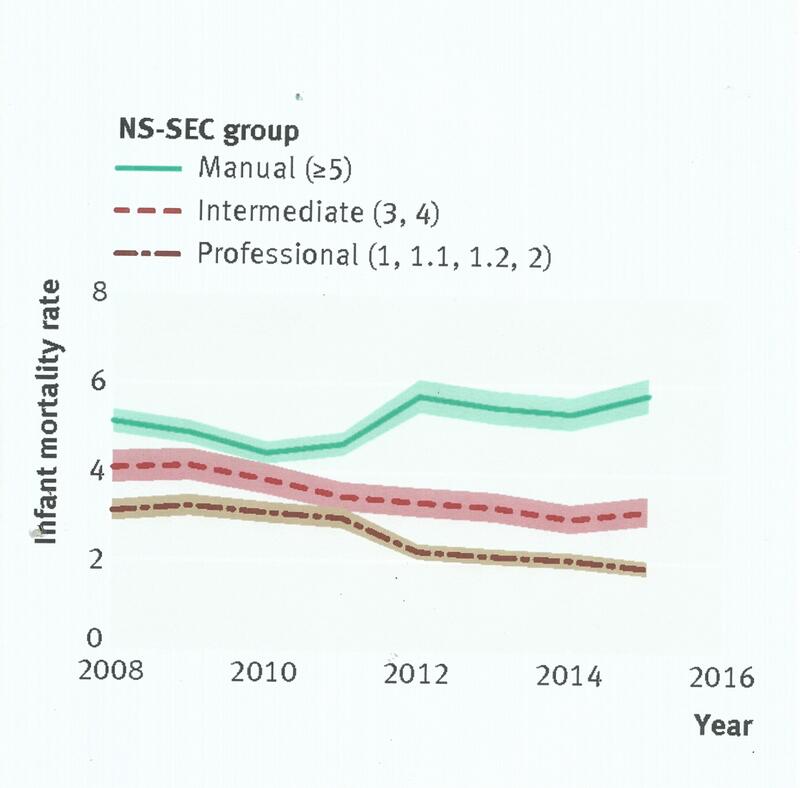 As illustrated by a graph from the British Medical Journal. "Formed by Government in 1998 to promote innovation, Nesta became a charity in 2012 and aims to mobilise ideas and imagination for the common good and boost the UK’s capacity to innovate. Collaboration is central to Nesta’s ethos in innovation across diverse sectors. Key projects in 2016 include the £7 million Arts Impact Fund, focusing on the social, artistic and financial return created by arts organisations; its Health Lab conference on the future of people powered health and FutureFest, exploring the future at Nesta’s high-profile festival in London in September 2016." I do not trust the Nudge Unit. Governments cannot form charities without political motivations. There are questions to be asked of the Charity Commission about why and how Nesta is a charity and about how it became so well funded in such a short time. I suspect it is a vehicle for the preservation of right-wing innovation economics to "nudge", privatise and reduce taxes, rather than to spend in the interest of human need and the prevention of ill health by ensuring the provision of adequate incomes and affordable housing for all. 10. Crime, unemployment and ill health are given as valid reasons for demolishing council housing. 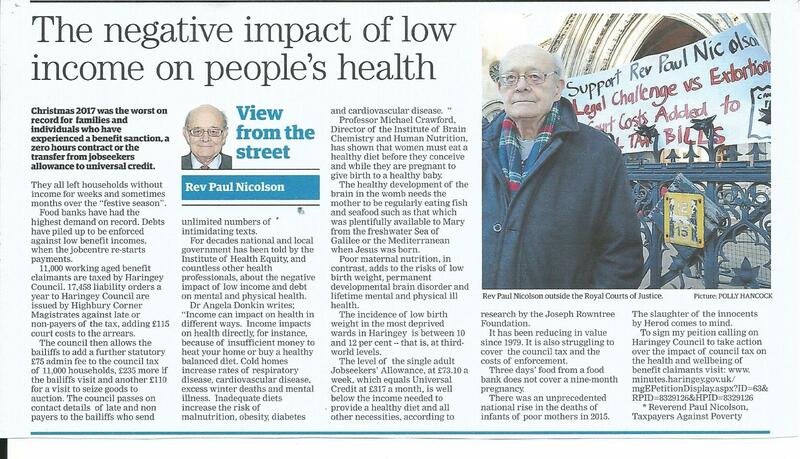 Better for councils to study the facts about health before making any decision affecting thousands of residents. I am grateful to theHampstead & Highgate Express for allowing me to publish the facts from health professionals whom the councils ignore. I remember being told by a member of the Special Operations Executive who fought with the resistance in France during World War II that the Nazis destroyed whole villages that did not "behave". The leader of Haringey Council wrote to The Guardian justifying the demolition of 800 council homes with the following sentence: "The Northumberland Park estate in north Tottenham, on which Aditya Chakrabortty based his well-meaning but misinformed story ('Lives torn apart and assets lost: what this Labour privatisation would mean', 20 January) already endures levels of unemployment, crime and appalling poor health, which no family should have to endure. I’m not going to accept that either." The leader of Southwark Council described the Heygate and Aylesbury estates as “symbols of inner-city neglect, with crime, antisocial behaviour, health inequalities and unemployment the only things that flourished there”. Before publication of my article, the Hampstead & Highgate Express checked my stats with the council, so they are agreed between us.